I never intend to stay away from my blog as long as I do, but the summer is just whizzing by and I can't seem to slow it down no matter what I do. I am either sewing, thinking about sewing, or shopping for things to use for sewing. If I don't pick up a needle and thread for at least a few minutes each day, it just doesn't seem right. I did work on my blog a bit the other day, and I think I accidentally misfired the page about my Mitered Square Blanket tutorial. In the process I also lost a page I was going to launch with photos of a lot of the quilts I've made. That one just vanished into thin air, so I have to start from scratch. I am over on Instagram some, but I haven't really posted lately over there either. You all know that there is so much out there in blog land and on Instagram to get involved in that you could spend every day just doing the sew alongs or blocks of the month. 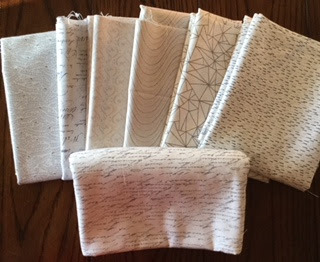 I have tried hard not to get too much more started, but I did succumb to the Kingfisher Sew Along hosted by Stitched In Color and Tales of Cloth. 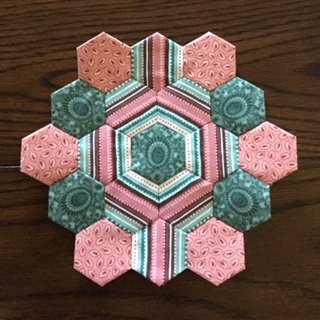 If you are a regular reader of my blog, you know how much I like anything with hexagons or English Paper Piecing. The Kingfisher Sew Along only has 46 - 1" hexagons. This is not my usual color pallet, but sometimes I like to work in brights. 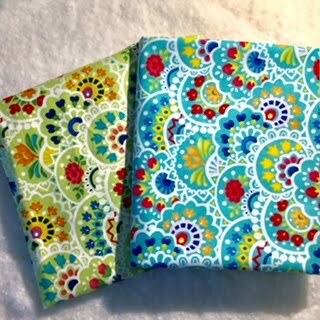 My friend Michele gave me a couple pieces of the Nancy Halvorsen fabric Bree. You can see that it is just perfect for fussy cutting. I have managed to find almost every piece of the collection in my summer travels. A lot of the hexagons you see in the photo below are cut from this line, but I almost never make an entire quilt from just one fabric line so there are hexagons from other lines, too. 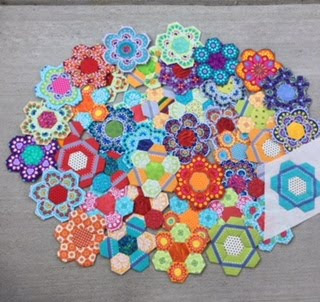 All 46 of my hexagons are sewn. I just need to get busy sewing them to the backgrounds. Here are a couple of my hexagons on the first background that I bought. Three and a half yards later, I decided that I didn't want all of the backgrounds to be alike and look too planned. So I bought some that were kind of alike but have a subtle pattern. Hopefully when I get the quilt put together, these won't all look the same. I finished another Lone Star quilt made using Quiltsmart. I thought it would be interesting to put something pieced in the corners. I like the look, and there is a lot less machine quilting to do in those big spaces. Here are a couple more double hexagons for that project. These are just fun to make, and I have to stop myself from just making these and not working on other things I have in the works. 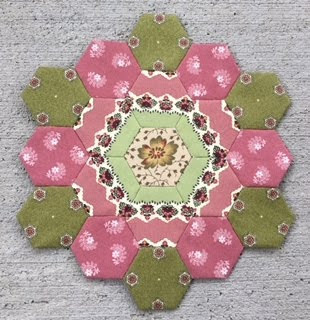 These hexagons are a good way to use up some of the 6 hexagon rounds that you have cut. And......they are even good for those that you can only find 5 of. Here is the scene from in front of my local Kroger store. 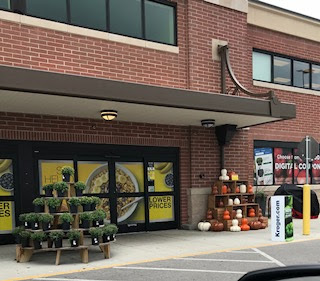 Yes, those are pumpkins and mums that you see. Can fall be far behind? I'm linking up with Judy over at Small Quilts and Doll Quilts for Design Wall Monday.